Cutting-edge magnetic and bioceramic technology allows extracting juices with the highest possible nutritional content. To prevent jamming and clogging while processing both hard and soft produce, the unit has an ergonomic pressure adjustment mechanism. Fixed parts might be more difficult to clean. 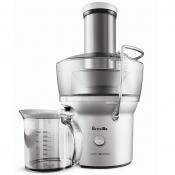 Allowing you to quickly process hard and soft fruit, fibrous root and green leafy vegetables, this Tribest juicer doubles as a food processor and homogenizer. It can help you make nutritious nut butter, yummy sauces, and home-made pasta noodles, as well as a variety of delectable desserts. It will be an excellent choice for you if you want to get the maximum value from food and drink. To ensure an excellent performance and durable use of the unit, the manufacturer has equipped it with a heavy-duty motor and stainless steel shaft; all other parts are made from FDA approved nylon. This consumes more power compared to other units. 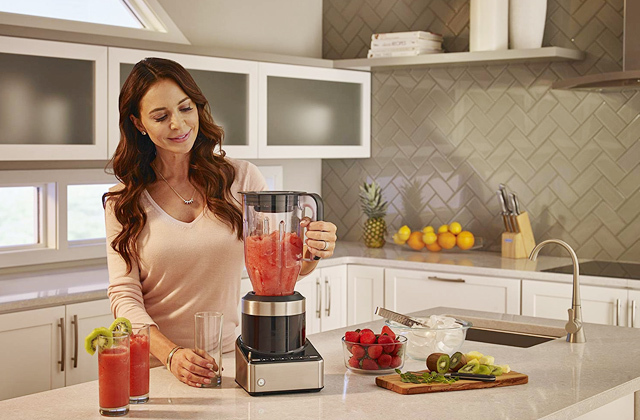 Compact enough to use at home, this commercial cold press juicer is capable of continuous high-level performance allowing you to you make freshly squeezed juices for all your family in a breeze. 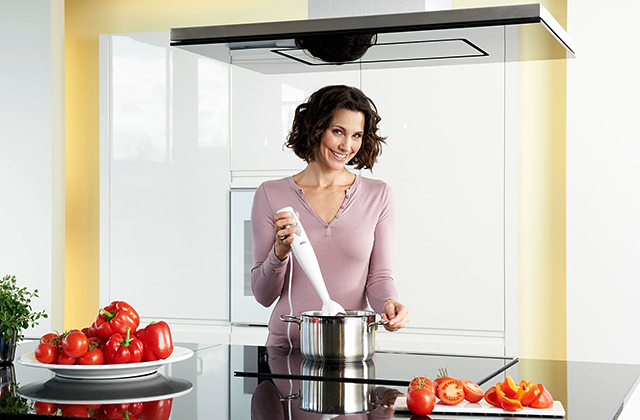 It is versatile, too: the appliance can be used as a homogenizer for making baby foods, frozen sorbets, and nut butter. 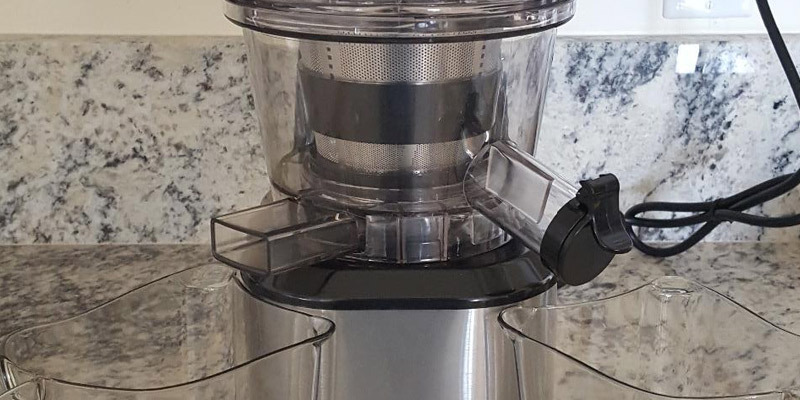 Thanks to the special pasta extruder and grinder/mincer attachments, you can use this cold pressed juice machine as a coffee grinder and even a pasta maker considerably saving your budget on buying several appliances. Non-transparent plastic bowls might stain over time. 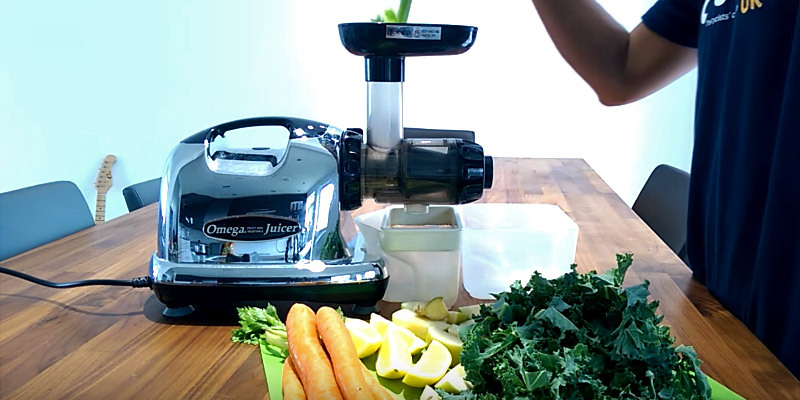 Delivering a forceful torque, this Omega cold press juicer will make fresh all-natural juices from soft fruit, frozen fruit, hard vegetables, leafy greens, and even legumes in mere minutes keeping all the vitamins and minerals intact. 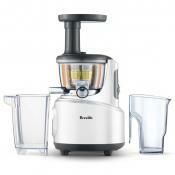 Besides, it comes fitted with a whole variety of attachments turning a juicer into a multifunctional kitchen helper. Let all your family enjoy healthy eating with Omega. Equipped with a new generation spiral propeller that is 2.8" higher compared to earlier versions, this innovative cold press juicer will help you get maximum juice yield in less time. Some users would prefer more detailed instructions. 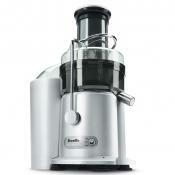 You can use this versatile Jese cold press juicer as a blender, soy milk maker, and even as a meat grinder. It delivers an efficient performance with the lowest noise level possible. The unit has an extra-wide chute and an ergonomic clamshell design allowing you to feed veggies and fruits into the chute in the most convenient way. 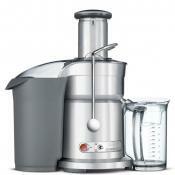 The included S/S strainer is perfect for making juice from various kinds of produce. This cold press juice has a thoughtful design to ensure clog-free operation. The settings are easy to adjust owing to a smart LED display. Some fibrous fruits and veggies might be not so easy to juice. The Aobosi AMR8825 boasts low noise and vibration level. Thanks to its low masticating speed, all vitamins and micronutrients remain intact. 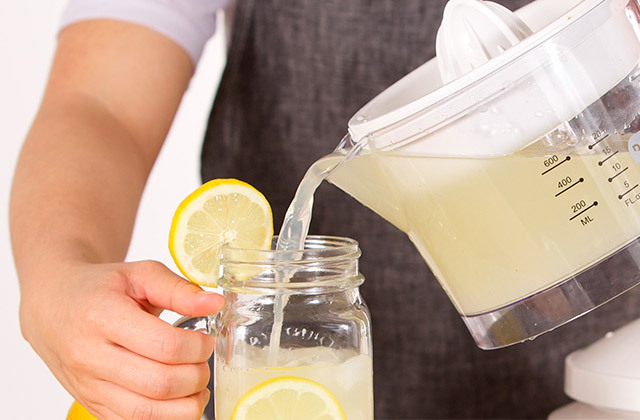 With its body made from durable BPA-free materials, the cold press juicer has a safety lock and non-skid feet to ensure its safe and comfortable use. 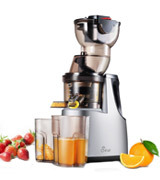 Boasting a heavy-duty design, the Tribest GSE-5050 cold press juicer utilizes the newest technologies allowing you to extract the maximum value of fruit, vegetables, and other gifts of nature. So, how does it work? First of all, this masticating juicer has special pocket recesses for slicing food ingredients, cutting points on the gears for clog-free cutting fibrous items, and gear teeth base for crushing produce. Next, the unique magnetic technology helps to create a focused magnetic field, making clusters of water latch on to vitamins and minerals, extracting as many nutrients as possible. At the same time, while turning, bioceramic twin gears emit far-infrared which has a stabilizing effect on the beverage, delays oxidation and prolongs your juice shelf life in the fridge. Moreover, to process soft, hard, and fibrous ingredients equally effective, with no jamming or clogging, the unit is equipped with a pressure adjustment mechanism. You don't even have to stop juicing to adjust the amount of pressure so you can easily use various ingredients during one session to make healthy juice mixes. In addition to a glass juice pitcher, plastic and wooden plunger, and a handy cleaning brush, the package includes a variety of attachments - a fine and a coarse screen to get more or less pulp in the product, homogenizing blank for processing foods, and even a breadstick maker set. Moreover, you cat buy a pasta maker set additionally to use the appliance as a pasta press, and a soft fruit outlet adjusting knob for tomatoes, oranges, and other soft fruit juicing. 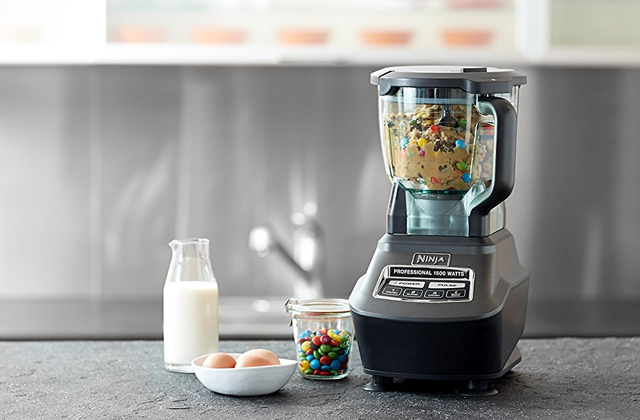 If you are looking for a functional food processor to help you with a variety of slicing, shredding, and mixing tasks, you are welcome to look through our review here. 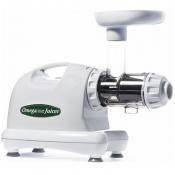 Champion Juicer G5-PG710: 7 in. Oh, the power! It is easy to assemble for use and to disassemble to clean. The carrying grip is well balanced and makes picking and carrying it easy. The pulp was super-dry. The machine worked beautifully, no issues. 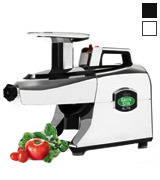 This commercial cold press juicer was designed to deliver an excellent performance even in case of heavy use. The unit is equipped with front and rear ball bearings so its powerful motor runs smoothly providing maximum RPM. To ensure durability, this model has a stainless steel shaft; all parts are made from FDA approved nylon, food-safe and durable. 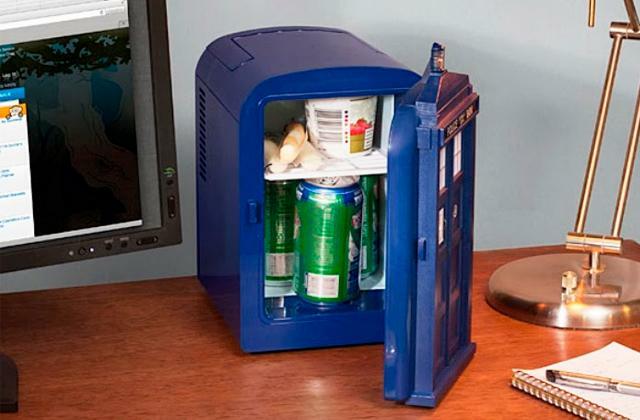 Easy to assemble, the appliance is simple in use. For feeding the processed produce into the chute, an ergonomic funnel and temper are included in the package. After you've juiced all the ingredients, the unit is easy to clean - just rinse its parts and brush the screen. 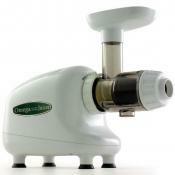 With this wonderful cold pressed juice machine, you can cook a variety of healthy drinks and foods for all your family. In addition to a juicing screen, the package includes a blank for making smoothies, baby food, frozen sorbets, and purees. Moreover, you can buy a greens attachment for juicing leafy vegetables and a grain mill attachment for grounding coffee beans. 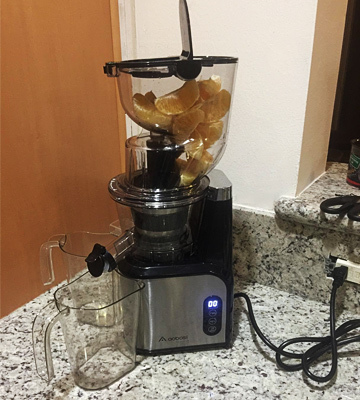 Summing up, being easy to operate and simple to clean, this Champion cold press juicer is an excellent appliance for home juicing for families living a healthy lifestyle. 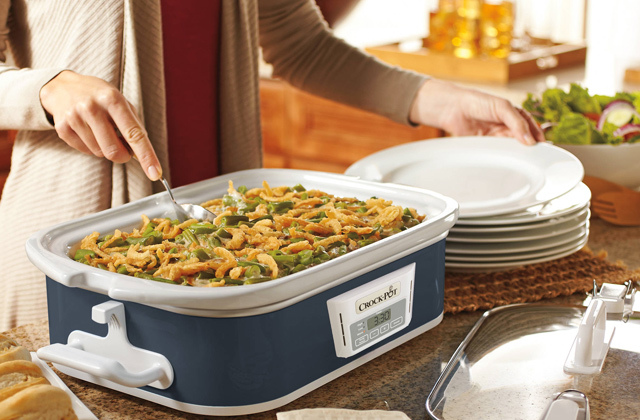 If you are looking for an appliance for hustle-free cooking healthy food, we recommend you to get a crock-pot. 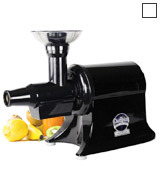 Because the juicer is all metal and has a powerful motor, it is somewhat heavy but manageable. The pulp is ejected from the bottom of the cutter casing, so there is no need to stop and remove pulp halfway through your juice project. Additional functions and extra options always add value to kitchen appliances since they expand the unit scope of application and allow you to tackle several kitchen tasks with a single device. 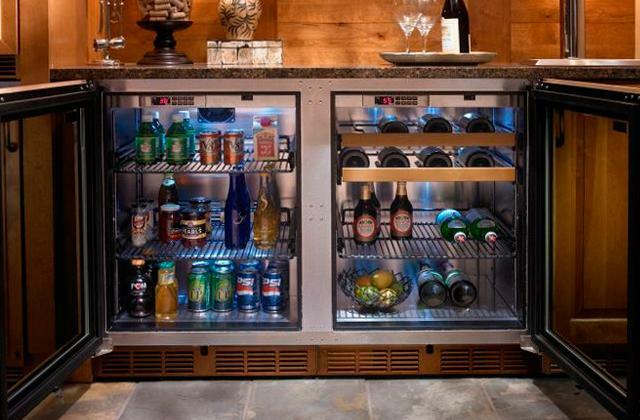 Yet, the biggest problem with multi-functional units is that some bonus features often appear inefficient, not to say useless, which makes customers be more cautious about all-purpose appliances. 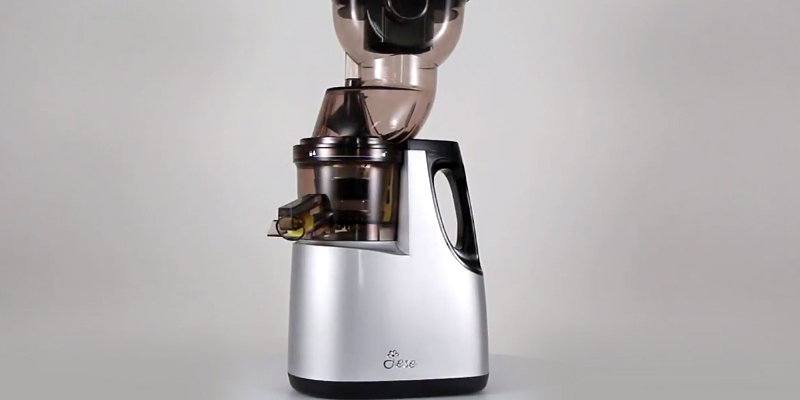 However, it’s not the issue with the Omega masticating juicer. With the functionality of this model going far beyond its primary intended use, all additional functions are fully operable and will be of great use for any home cook. 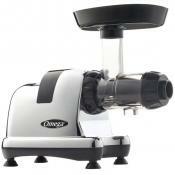 Initially, the Omega J8006 is meant for juicing. Applying a masticating juicing technology, it processes produce at a low speed of 80 RPM that prevents heat build-up and oxidation to keep all vital nutrients, minerals, and antioxidants in the juice. Meanwhile, a horizontal design paired with a powerful rotation torque will allow handling any produce, be it soft fruit and leafy greens, hard vegetables, root crops, and legumes or fibrous plant. 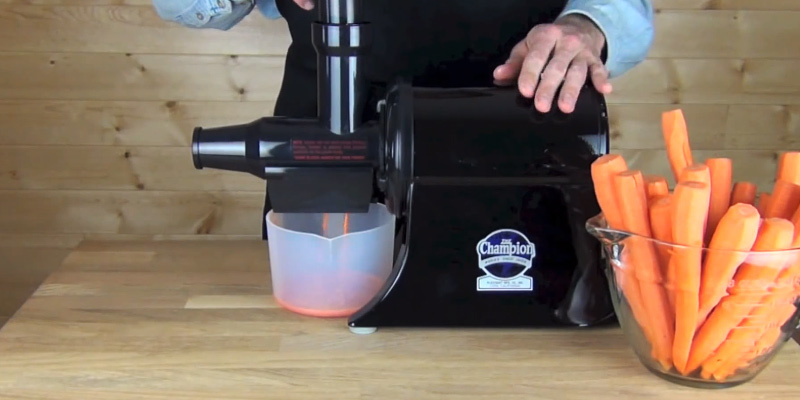 Whatever you load into your juicer, you’ll get the maximum amount of juice squeezed. 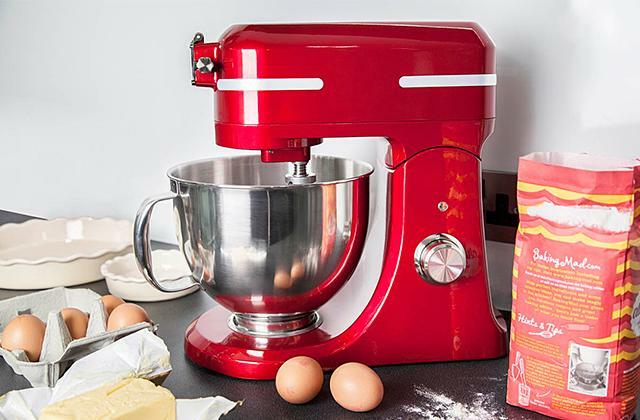 Besides, the unit package includes several pasta nozzles as well as a food processor, homogenizer, and grinder attachments that will let you extrude homemade pasta, mince herbs and seasonings for delicious sauces and dips, make baby food from all-natural ingredients, grind coffee for your flavorful morning cup, and more. 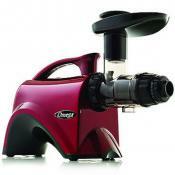 As functional as it is, the Omega juicer is compact and very easy to use. 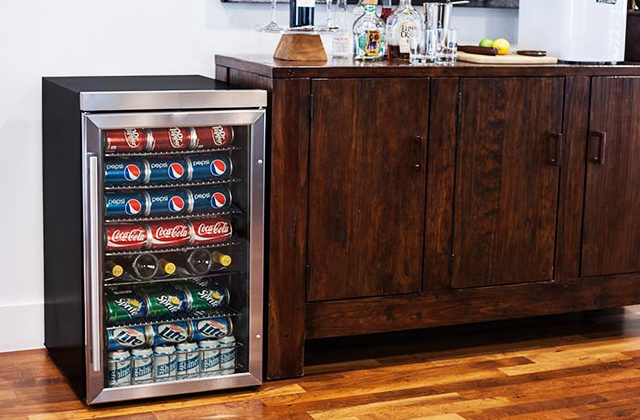 The machine will perfectly fit any countertop and even a modern vibe to your kitchen interior, thanks to its sleek and stylish design. Though the unit is delivered disassembled, the assembly is a breeze and all attachments are easy to change, the whole process taking mere minutes. To add comfort to appliance operation and maintenance, the set contains two plastic bowls for juice and pulp accordingly, a plunger, juice sieve filter, and a cleaning brush. So what we have here is much more than a juicer. 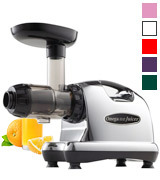 The Omega J8006 nutrition center juicer cleverly and efficiently combines the functionality of several kitchen appliances. 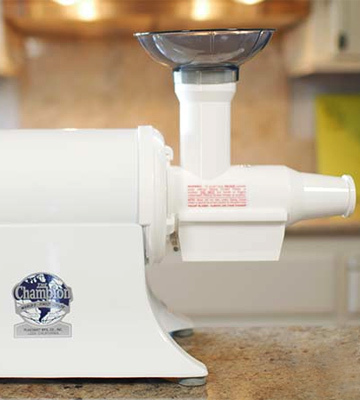 Champion Juicer G5-PG710: 23 lbs. Light, portable, good for travel by car, will run off AC adapter in car, only 150 watts. This machine is so efficient, the pulp was dry beyond belief, but still I chucked the pulp into my worm bin. I am also amazed at how much juice it produces in such a compact design. 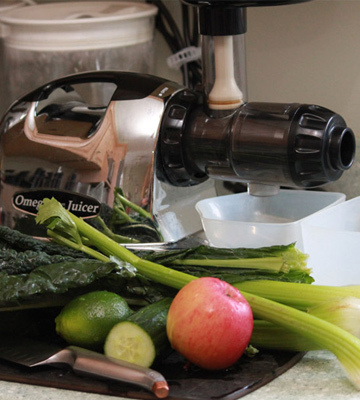 If you want to make your diet healthier, this cold press juicer is a real find. First of all, the machine features a low squeezing technology - it processes the ingredients at only 37 RPM preserving vitamins, minerals, enzymes, and trace minerals to the maximum. Designed with a user's comfort in mind, the unit features an extra-wide chute allowing you to process larger items without pre-cutting. Just keep in mind that if you are juicing apricots, peaches, or plums, kernels are to be removed. 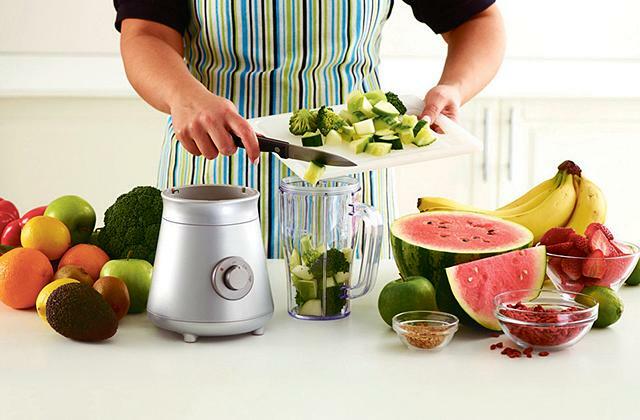 At the same time, the appliance boasts an innovative spiral processor that cuts, chops, minces, squashes, and grinds the produce to squeeze your nutritious juice as quickly as possible. When your natural energy booster is ready, there is one more secret to keep it fresh longer - a special valve with a silicone plug allows adjustable beverage dispensing and prevents its oxidation. 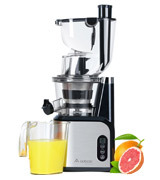 However, it is not only juice that you can make with this fantastic machine. From baby food and frozen sorbets to soy milk and ground meat - the unit does it all. 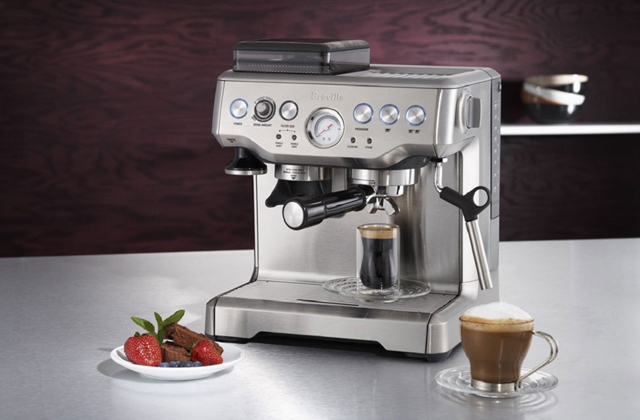 The appliance comes with a fine filter for making smooth juices and soy milk and a loose filter to prepare delicious drinks with pulp. In the box, you will also find an ergonomic drip-dry stand for drying parts after cleaning. For making delicious healthy meals for all your family, consider buying a food steamer. Material feels high quality. All in all we love it. I am glad my wife bought it for us. 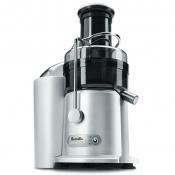 It does an excellent job extracting the juice and it is really quiet. Also you don’t need to cut fruit into really small pieces, as long as you can put it in, that’s enought. 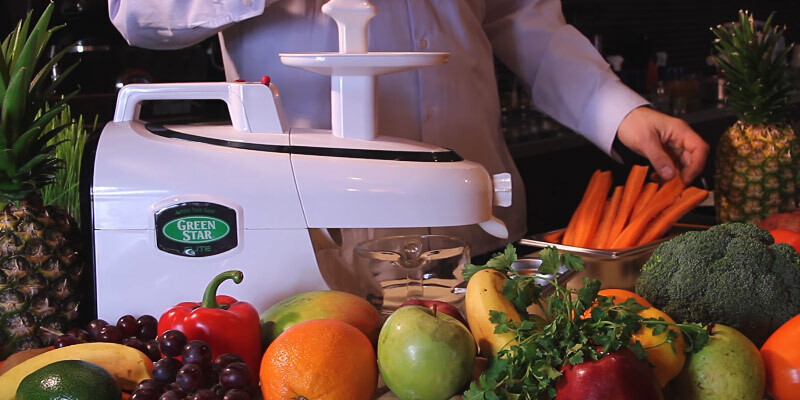 If you are looking for an efficient appliance for comfortable juicing of varied produce, such as soft and hard fruit, fibrous vegetables, and leafy greens, here it is. 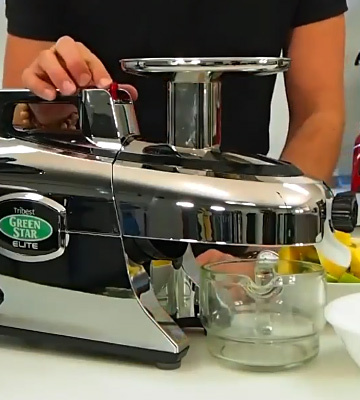 No matter which of the ingredients you choose, this low-speed cold press juicer will help you make beverages with a high nutritional value in a breeze. With a low speed of 47-60 RPM, allowing you to preserve maximum vitamins and micronutrients, its powerful motor can provide up to 10 minutes of continuous operation. The appliance's ergonomic design will make your healthy juice preparation as easy as possible. First of all, the unit has an extra wide chute for feeding whole fruit and vegetables including large apples and oranges. Next, it has a user-friendly control panel with an LED display. 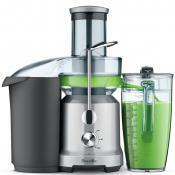 Made from high-quality materials, the cold press juicer has a safety lock and a reverse function to prevent clogging. Additionally, it boasts a low noise and vibration level, which makes the unit even more convenient in use. Finally, the appliance is simple to maintain. It is easy to clean (a cleaning brush included), can be assembled/disassembled in a snap, and is quite convenient for storage. A halogen oven is a multifunctional and compact appliance for cooking healthy and delicious foods. 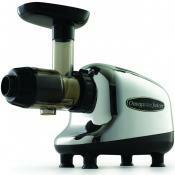 Champion Juicer G5-PG710: 10 in. I like that it’s quiet as well. For the size, it’s quite small, it does not take that much space, so it stays all the time on my counter top. By the way, it is easy to clean and it is enclosed with a little brush . Fruit, vegetables, and greens are a natural source of vitamins and minerals essential for our health. Believe it or not, a glass of freshly-squeezed juice can be either a nutritious energy booster or just an ordinary drink, depending on a juicing method. Though centrifugal juicers make juice faster, they appear to be less effective than low-speed juicers because most vitamins are sensitive to heat produced by the blades rotating at a high speed. On the other hand, using a slow masticating cold press juicer not only helps to extract more juice from the same amount of produce, it also slows down further oxidation of the beverage and thus prolongs its shelf life in the fridge. In addition to making juice from vegetables, fruits, and greens, some cold-pressed juice machines can be used for preparing delightful frozen desserts, delicious sauces, and other tasty treats. 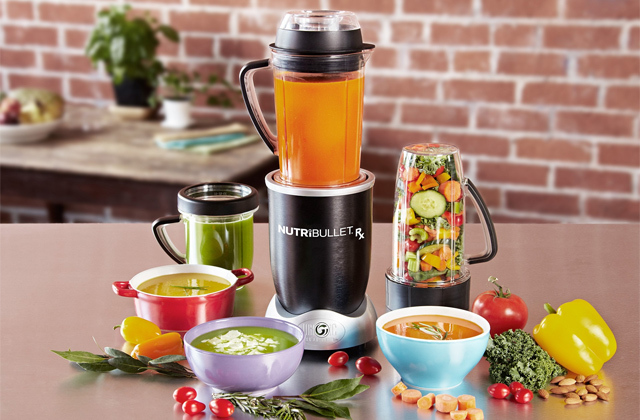 If you are into a healthy lifestyle, using this wonderful appliance is a great way to incorporate nutritious drinks and foods into your diet. So we offer you to look through our cold press juicer comparison and pick a juicer that meets your requirements best. To stay hydrated throughout the day, do not forget to carry with you a bottle of water or freshly-squeezed juice. If you are into athletics, you may also be interested in our blender bottles review. 1. Vitamin, Wikipedia. February 23, 2018. 2. Cynthia Sass Juice or Smoothie: Which One Is Healthier? Health. May 17, 2016. 3. How Long Does Fruit Juice Last? Eat By Date. 4. Jeff Taraday Getting Started With Juicing: What You Need To Know, Breaking Muscle. 5. 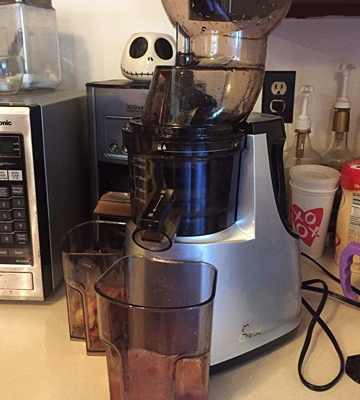 David Grimes Juicer vs. Extractor, Our Everyday Life. September 28, 2017.